ON SALE NOW! Enjoy up to 20% off our regular rates for last-minute stays. Enter your dates to see the best price. 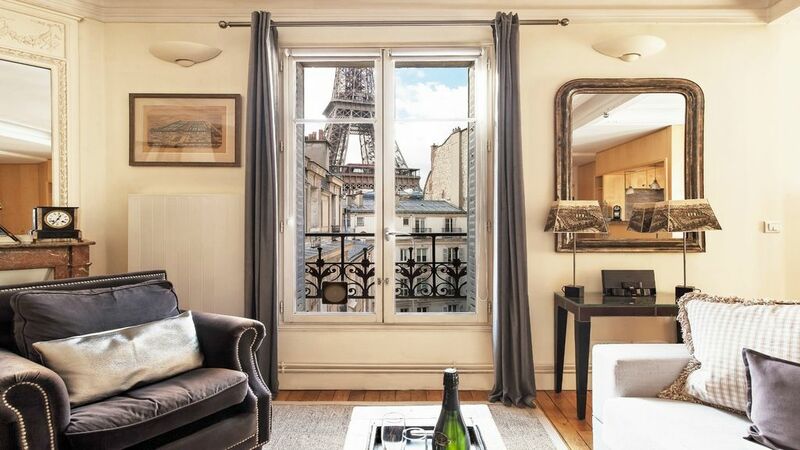 The brilliant views of the Eiffel Tower steal the scene at the gorgeous Romanée, but guests who can tear themselves away from the impressive vistas will find a lot to adore about this striking two bedroom, 2 ½ bathroom Paris Perfect vacation rental. The gracious space features an elegant collection of antique furnishings and modern style, creating a completely romantic atmosphere that will make it easy to linger for a lazy afternoon or evening. The OPEN LIVING AREA features ample seating to lean back and take in the striking Eiffel Tower views from the large French window, while the adjacent dining area with a hand-painted Parisian street mural is a comfortable and downright inviting spot for hours-long meals and family celebrations. The WELL-APPOINTED KITCHEN is connected via a wooden doorway, and offers a crisp and clean locale to whip up Parisian feasts, with plenty of storage space and solid tile countertops. The TWO BEDROOMS at the Romanée are both grand and graceful, with delicate décor, ample built-in storage and a dual-king bed and double bed respectively. There’s also a queen-size wall bed found in the living room for additional sleeping accommodations, as well as two bathrooms, including one with a bathtub and fixed shower and another with full glass-lined shower and contemporary basin-style sink. In addition there are 3 large mobile A/C UNITS to keep you cool. Outside, the romantic streets of Paris await, with a wonderful collection of sites and attractions that are found just a stroll away. Wander over to the Eiffel Tower, Champ de Mars gardens the banks of the Seine River for leisurely self-guided expeditions, or embark on a cultural exploration of the Musée d’Orsay or the Rodin Museum located a short walk away. Trendy boutiques, affordable bistros and exceptional cafés and restaurants are all found in the neighborhood, as well as the local Pont de l'Alma and Ecole Militaire Metro stations to quickly and easily reach all the top spots in Paris. Inside and out, the Romanée is a quintessentially romantic retreat surrounded with wonder, from the sky-high Eiffel Tower views to the cozy accommodations that will entice visitors to return again and again. ‘Til end-Apr 2019: Please note that works are currently taking place in the building where Romanee is located. Since the apartment is on the 6th floor we do no foresee that the works will cause any disruption and if you plan to be out and about during the day then this should not be an issue at all. However, if you experience any inconvenience whatsoever, please let us know! Our successful Paris apartment rental business began with one special pied-à-terre located on the Left Bank near the Eiffel Tower. Friends and family loved staying there for the fantastic Paris views and the location – walking distance to cafés, landmarks and wonderful shops. We have a passion for sharing “la vie Parisienne”—the Parisian lifestyle—and that passion fueled the creation of our boutique vacation rental company. Our goal is to help you fall in love with Paris while discovering, exploring, tasting and savoring new sights and experiences in the incredible City of Light! You invest a lot to come to Paris and we want you to enjoy every minute, from the moment you wake up in the morning and buy buttery warm croissants around the corner to enjoying a glass of wine and watching the sunset behind the Eiffel Tower. We know you have dozens of options to evaluate on VRBO. We have nearly 20 years of experience finding the very best vacation rentals in Paris. What makes our apartments unique is that they’re beautifully decorated, welcoming and located in the best and safest locations in Paris. Most of our apartments offer stunning Paris views for memories of a lifetime. Most important, there is a friendly English-speaking team available onsite seven days a week to help you in every way. They are there to offer a warm welcome when you arrive, to answer questions and help you feel at home. You’ll love living like a Parisian surrounded by a charming Paris neighborhood and strolling to landmarks and monuments nearby. Our apartments are located near lovely open-air markets where you can shop alongside Parisians for the freshest foods to enjoy at your home away from home in Paris. That is what we want you to experience in Paris, so you’ll come back again and again! The decision was simple: location, location, location. We chose the 7th arrondissement on the Left Bank of Paris after a long search, because it was the absolute best location we could find – combining a lively village-like atmosphere with an unbeatable location in the heart of Paris. Financially it was a stretch but it has been worth every penny. We wanted to live in a beautiful quartier located near the romantic Seine river, surrounded by bistros and shops and walking distance to classic Parisian sights including the Eiffel Tower. We also wanted a safe neighborhood, centrally located with easy access to landmarks, museum and fabulous open-air markets and specialty food stores. The 7th offered it all! We loved the fact that the 7th has maintained its unspoiled village-like feel where we greet our butcher, baker and local cheese specialist daily. They know our favorite cheese and just how thick and browned we want our baguette. That is what we wanted to find – an authentic and intimate Parisian neighborhood. . We tried a variety of neighborhoods and the 7th offered the best access on foot to everything we savor and enjoy about Paris: Paris landmarks, museums and monuments on the Left Bank, to world class shopping on the Right Bank, to the antique dealers on the Rive Gauche, to the Musée d’Orsay, the Louvre, Rodin Museum, Eiffel Tower and even the Arc de Triomphe. We can walk to discount stores in the quartier next door, enjoy morning jogs and bike rides in the lovely Champs de Mars gardens across the street, take a sunset walk along the Seine to Place de la Concorde and home along the riverbank. The Eiffel Tower view is one of the best features of this Paris Perfect apartment, so close you'll feel like you can reach out and touch it. Enjoy relaxing evenings at home with a spectacular view of the Eiffel Tower the perfect backdrop. Guests tell us time and time again that watching the nightly lights on the Eiffel Tower from their balcony was the highlight of their vacation. Three powerful air conditioners: excellent mobile units which cool the apartment beautifully. Like all mobile A/C in Europe, the hot air is vented thru the windows via a large tube. Highest quality sheets for a luxurious stay. Highest quality towels for a luxurious stay. Starter supplies includes coffee, tea, sugar, milk, etc. Fully-equipped kitchen with pots, pans, cookware, utensils, glassware, dishes, and so on. TV: CNN and other English news channels available. dual-standard so you can bring your own movies or rent French ones nearby. This is a commercial zoned property, one of the only 100% legal listings in Paris. We provide a welcome basket upon arrival. You will find a handy detailed Paris manual that outlines the key features of the apartment and the surrounding neighborhood. To get you started, we provide starter supplies of dishwasher and laundry soaps, garbage bags and paper towels, Nespresso capsules, tea, sugar, milk, etc. We supply luxury cotton towels, high thread count sheets as well as bath soaps and hand lotion. Free telephone calls to landlines and cells in the United States and Canada (except Alaska). Free calls to landlines only in Europe, Australia, New Zealand and many other countries. You will have access to free high-speed wireless internet and cable television. Everything you need, AWESOME view! Property is truly fully equipped. We didn’t use the kitchen to cook but if we wanted to, it would have been very easy. Location is excellent with restaurants and grocery on the same block. Bus is close, metro a little farther but still easy distance. The best feature is the unobstructed view of the Eiffel Tower. Gorgeous both day and night. Kevin explained everything about the apt well, absolutely nothing negative about our visit. We’d stay there again and would highly recommend it to anyone. Thank you for posting your review. Other readers do enjoy reading what has been said by someone who has recently stayed in the apartment. A Perfect Stay in Paris! Our Paris Perfect experience exceeded our expectations! The view is as advertised -- it's stunning! The apartment was clean and very comfortable. While the 2nd bedroom would have been a little tight for two teen girls to share, the Murphy bed in the living room addressed that. In fact, my daughter loved waking up to a view of the Eiffel Tower! The neighborhood was safe, reasonably quiet and within a short walk of some great restaurants and the market on Rue Clear. Oh yeah, the Eiffel Tower at your doorstep never got old either. The staff was accommodating and made check in and check out a breeze. We'll definitely use Paris Perfect again! Thank you for posting your review. It is so helpful for others to read what has been said by someone who has stayed in the apartment. The apartment was wonderful. Obviously the view was incredible, and the general location was perfect for both major sightseeing excursions and just short walks around the neighborhood. The apartment contained all the amenities and it was very tastefully furnished. My only recommendation for future visitors? The safe operates differently from most hotel safes. Read the instructions carefully before operating. Thank you for posting your review. Reading what has been said by someone who has stayed in the apartment is so helpful to others. We spent a week at Romanee in July 2016. The location was extremely convenient and magical. We woke up every morning to a view of the Eiffel tower and went to sleep seeing its twinkling lights. My morning routine was to wake up and walk to the nearest "boulangerie" bakery, to get French croissants and pastries. The apartment had a very functional kitchen to make breakfast and lunch. We ate out for dinner. I would highly recommend this apartment and Paris Perfect. They explained everything really well and the tours we went on were great. Kasia's fashion tour was a hit and my girls loved Alex for the night tour. We had a fantastic time.